hopefully goes a long way in cheering a friend in the hospital (who at this posting has returned home. hooray!). 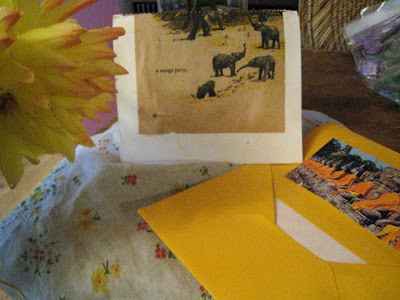 glued up this card + little sewn journal; with vintage book page mod podge cover featuring elephants having: "a mango party." also included a dahlia from our front yard (no joke, they are still blooming). chicken soup. and one of the gorgeous hankies you may have seen from my new stash. just spreading the love.